In a previous post (link), I explained why the TI-36X PRO is a great calculator is you are taking the Fundamentals of Engineering or PE Exam. But it has one problem: a programming bug. 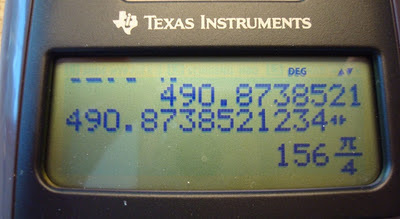 Essentially, the bug is a display problem which only occurs when you try to display a mixed fraction involving pi, but still, any time your calculator is giving you wrong answers it is a serious problem. Summary: The only reason you need this product is if you are taking a test which has a strict calculator policy, such as the Fundamentals of Engineering or PE Exam. It has high level math capabilities without the graphing and programming of TI-89, TI-92 etc. But if you are taking one of those tests, this calculator is a fantastic. 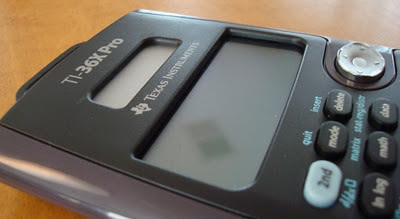 Review: The TI-36X PRO is a calculator which seems to be designed specifically for standardized testing. Basically, it takes most of the features of an advanced graphing calculator, such as a TI-89, and puts them in a package that is allowed on your standardized test. I bought this calculator for the FE Exam and I as amazed at how much it could do. Solver: One of the most powerful features is the numerical solver. You can enter any single variable equation and solve for the variable (a numerical result). This comes is so handy on a test where you are provided a formula and the variable you need to solve for is not isolated. You have to be a little careful, though. The numerical solver only returns one solution, even though if the equation you entered has multiple solutions, and there is no warning. The polynomial solver, on the other hand, does return all possible solutions. Obviously, the equation must be in the form of a polynomial to use this feature but usually that is not a problem. As if that wasn’t enough, there is also a system solver. This can be used when you have a 2x2 or 3x3 linear system of equations. This feature is somewhat duplicative since you can also just transform a representative matrix into reduced row echelon form (rref) on the matrix menu, but oh well.